How many of your current customers do you think you can target using Google Ads? Don’t know? Good news! Google can tell you. Google will even tell you how many of your customers they can find on the Search Network, the Display Network, YouTube, and Gmail. Customer Match allows you to use your customer data in your Ads targeting. And today I am going to teach you how to use Customer Match. In this post and video, we’ll go inside Google Ads and I’ll show you how to upload your customer lists. We’ll also run a live Customer Match experiment. Our experiment will test Google’s Customer Match results using customer emails vs. physical mailing addresses. Follow along! And let’s learn how we can use Customer Match to improve our efficiency and targeting in Google Ads. Creating your Customer Match list is pretty simple. Let’s walk through how to get your list set-up. To get started, click the gear icon in the top right-hand corner of your Google Ads dashboard. Then, select audience manager from your Shared Library menu. Next, click the blue “+” icon, and choose to create a customer list. Once you’re in the customer list screen, you can start to set up your new list. You can give your customer list a name. Then, choose to upload your list of customer emails, phone numbers and/or mailing addresses. Once you have uploaded your list, Google will let you know if your customer emails are in the correct format. Google was able to interpret 100% of the emails on my customer list. After your list is in Ads, Google will attempt to match your list with their targeting data. The matching process takes less than 24 hours to complete. 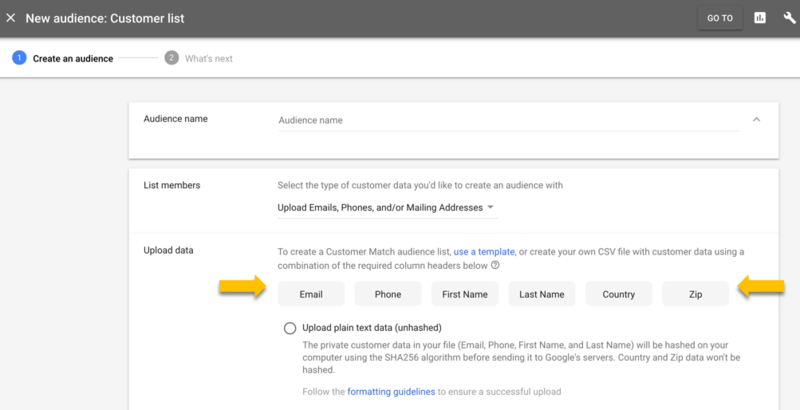 Google was able to match over 50% of the customers on my test email list! Ads also provides you with a report of where Google matches your customer data. They show you the number of customer matches they found on each of their networks. The entire process of preparing my customer email list, and uploading into Google Ads took about 30 minutes. And the result, I now have an audience list that can make my advertising more efficient. Out of over 3,000 customers, I was able to match 50% of them with Google’s data. I can target these customers with ads for new products. Or exclude them from future ad campaigns. Uploading a customer mailing address list requires some additional formatting. You need to include the first name, last name, country and zip code for each customer. This list took me a bit longer to prepare than my simple email list. I had to work out a few problems with my CSV file to get my list to upload correctly. One item of note: You need to format your country column with the correct two-letter country code for each customer. After I worked all the bugs out my CSV file, I had an address list of 4,199 customers from 97 different countries. 97 countries, wow! It’s exciting to see that PPC Course has spanned the globe!! Out of the 4,199 addresses I uploaded, Google was able to read 3,736 of them. I was skeptical that Google would be able to match my customers using the data in my mailing address list. The simple fields, name, country, and zip seem like they might generate a lot of false positives. But, I was also excited to see the results of my experiment. Google matched approximately 24% of the customers on my mailing address list. The volume of my customer matches across Google’s networks was very consistent. Once again, Gmail had the highest match rate out of all Google’s networks. It took a while for Google to return the demographic data for my customer lists. In fact, at the time I completed the above video Google still hadn’t reported any demographic data for my lists. Eventually, Google populated the demographic data for my customer email list. But, Google still hasn’t returned any demographic data for my mailing address list. We do not collect phone numbers from our PPC Course customers. So, I was not able to test the effectiveness of customer matching using phone numbers. 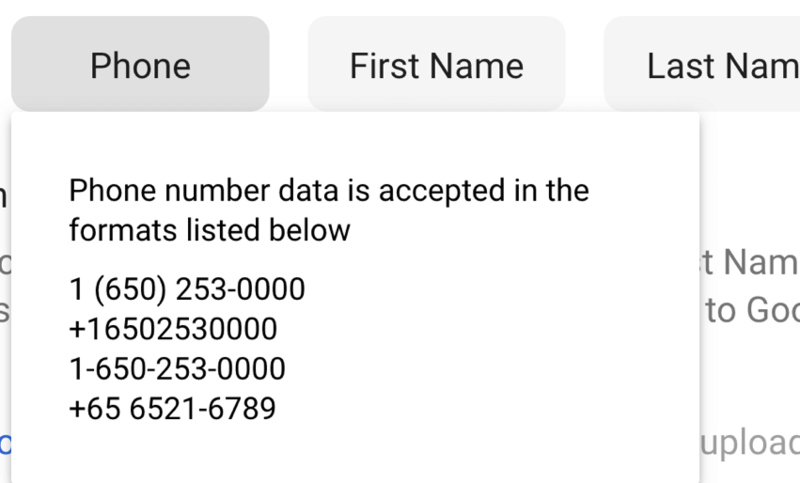 I did notice that Google allows a lot of flexibility in the formatting of phone number data. If you have experience creating match lists using customer phone numbers, leave a comment below. Let us know how effective phone matching is, and share your thoughts about this feature. Customer Match lists offer us some new and exciting options for our ad campaigns. Here are some specific strategies for Customer Match lists. Targeting existing customers is one of the most efficient forms of PPC advertising. Say, for example, you were promoting a renewable product. Possibly a product with expensive ad costs. You could run a campaign limited to your customer list. This strategy would potentially reduce your costs and increase your conversions. What if you have a product people only need to buy one time? Excluding your customers from your ad campaigns will make your advertising more efficient. You’ll cut down on serving ads to people that don’t have any interest in purchasing your product. Customer Match isn’t perfect since we only have a 50% match rate. But, excluding the customers that Google matches should still save us money. Since the ultimate goal is efficient, cost-effective advertising, every little bit helps. When it comes to targeting with Google Ads, information is power. The more data you can build on your target audience the more efficient you can make your advertising. The most cost-effective PPC campaigns are the ones that incorporate granular data. The more granular you are with your ad targeting, the more you can improve your results. Look at Customer Match as the next level of granularity beyond your remarketing. If your data in your CRM is up to date, Customer Match should result in even more specific targeting. Generally speaking, targeting brand/product-aware consumers should produce your best ROI. So, targeting current customers has the potential to be even more efficient than remarketing. Keep in mind, your Customer Match lists are only as good as your customer data. If you’re not working to grow your lists and bring in new leads, your Customer Match lists will get stale. As your list get’s stale your campaigns targeting those lists will become less effective. You need to continue to run multiple campaigns and target new leads, as well as your existing customers. Have you tried Customer Match? What do you think about Customer Match? Do you use Customer Match lists in your targeting? If you do, how effective are they for you? Leave a comment below and share your thought on this PPC strategy.